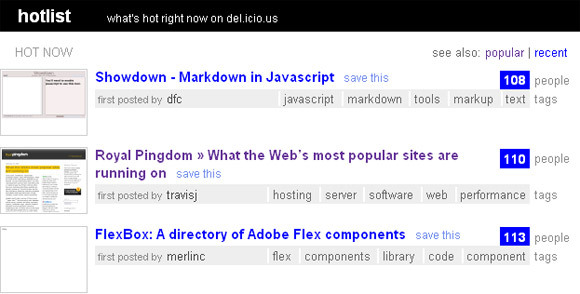 No, we’re not monitoring the uptime of the Del.icio.us hotlist… We’re in it. Our survey about the software and technology behind seven of the Web’s most popular sites turned out to be quite a hit. In spite of being released just this Monday it’s already been mentioned in lots of articles and blogs. This morning the survey even ended up on the exclusive hotlist on the front page of Del.icio.us, the mega-popular social bookmarking site. We would like to thank everyone who’s bookmarked, linked to and written about the survey and helped it become so popular. If you haven’t seen it yet, what are you waiting for? Find out what the Web’s most popular sites are running on.